Today is the anniversary of the end of the First World War. It is called Armistice Day and marks the date the armistice was signed between the Allies and Germany that brought the end of WWI. Tomorrow, November 12, is Remembrance Sunday, acknowledging those who died in WWI, WWII and other wars. Many people have traditionally chosen to wear a red poppy in memory of those who died in war, while some prefer to wear a white poppy because they feel the red one glorifies war rather than promoting peace. In the past, some people have chosen to wear a purple poppy to honour animals that died in wartime. This has become something of a controversial issue of late. I believe it should be personal choice whether to wear a poppy of any colour or none at all. 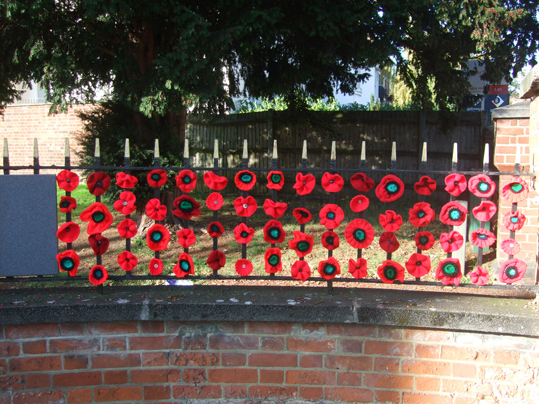 However, I was taken by the efforts made in my local community to knit and crochet dozens and dozens of poppies and attach them to the railings in the park near where I live in south-east London. The photograph at the top shows just one section - it is a really impressive amount of work. Today, I choose to honour community spirit with this photo.